The actual work is much brighter than the pic - blame the dullness on the evening sun. Here in India, the festivals marking the beginning of the spring have been/are being celebrated in different parts. Spring is known as Basant in Hindi. Basant Panchami was celebrated a few days back. There are kite flying festivals being organized and generally the mood is of celebration. When I started couching, I didnot expect the result to be so good.Probably since the expectations were low,the outcome turned out be much better. This is what happens in real life too, right? Disappointments are greater when there's too much of expectation.What do you think? Deepa, these two flowers are just beautiful, I absolutely love your colours... my my, you are moving along quickly! Hugs. This is wonderful! 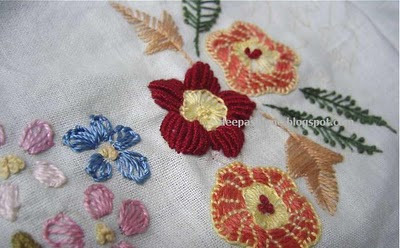 I do like those couching for flowers and those pistil stitch for leaves, they look like maidenhairs - love them! 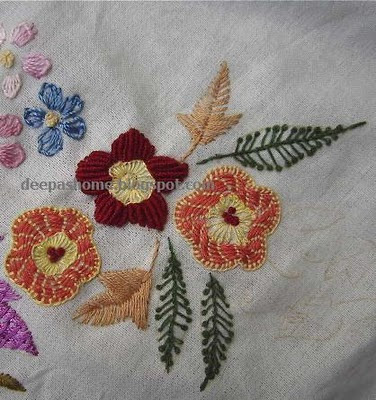 deepa,realy loved those couched flowers.. so neat..
WOW Deepa, the block is soooo beautiful. love the couched flower. they are perfect..
Hi, your embroidery is beautiful, I like the way you use a large variety of stitches. Also color selection is bright , the way flowers should be. 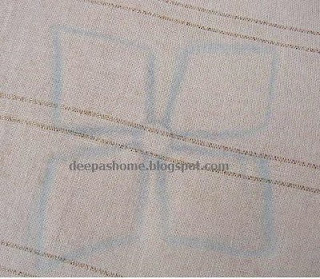 I have embroidered for many years and can see when some one else enjoys this wonderful art. Keep on with your designs, they are a joy to look at and I find them inspiring. Cheers from silverneedle in Australia. Love all the flowers in the block. couching has come out so beautiful. Beautiful flowers. Really liked couched flowers and of course your desi tadka is really good. Fallen in love with your flowers.